My work investigates what goes wrong with the female reproductive organs in pathologies, specifically endometriosis and gynaecological cancers, and how we can fix it. Gynaecological cancers have an average 5-year survival rate of just 45% worldwide. These types of cancer constitute the highest mortality of all cancers affecting women - 70% of patients relapse due to chemo resistance. Gynaecological diseases such as endometriosis occur mainly in young women with no definite therapeutic treatments. My research interests are specifically directed towards preventing these diseases in the first place, improving survival rates of these cancers by uncovering next generation therapeutic strategies and to improve quality of life of affected patients by designing chemotherapy reduction strategies. As a child I was fascinated by nature and patterns - coral forests in our oceans, petals of a flower. I pursued qualifications in veterinary medicine and obtained my PhD focusing on understanding molecular patterns constituting basic biology. While at Harvard University in Boston my research led to work in molecular patterns and how diseases interrupt these. These experiences ignited my passion for discovering disease prevention and treatment strategies. Current-day science gives you the ability and opportunity to invest your inquisitiveness and create healthcare of tomorrow. This keeps me going as a scientist. To develop prevention strategies for reproductive tract cancers and diseases, as well targeted therapies that lead to improved prognosis and new chemotherapy dose-reduction strategies for improved quality of life for women suffering endometriosis, ovarian uterine and other gynecological cancers. Associate Professor Pradeep Tanwar is an Australian Research Council Future Fellow, a Cancer Institute NSW Career Development Fellow, and group leader of the University of Newcastle gynaecology oncology program. Associate Professor Tanwar initially trained in veterinary medicine, followed by conferment of a PhD in reproductive tract biology from the University of New England, NSW, and a Postdoctoral Fellowship at Harvard University, USA, in the research of reproductive tract cancers. 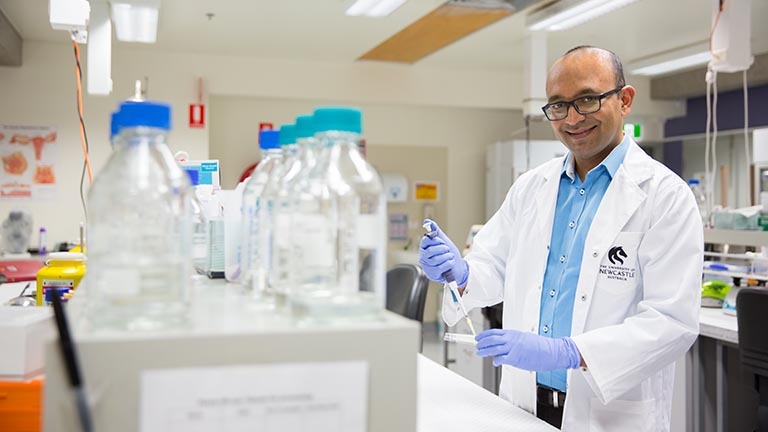 Throughout his research career, Associate Professor Tanwar’s work has focused on understanding the development of reproductive tract diseases and devising new and innovative ways to treat them. The quality and significance of Associate Professor Tanwar’s research is recognised in being awarded 15 prizes and awards, including the 2016 Emerging Research Leader Award from the Society of Reproductive Biology (the highest prize awarded to an Early-to-Mid Career researcher in the area of reproduction) and the 2015 Best Clinical Research Presentation Award from the Australia New Zealand Gynecology Oncology Group. Associate Professor Tanwar’s work has been reported in international journals including PNAS, Cancer Research, Nature Genetics and PLos Genetics. His research program is currently supported by funding from National Health and Medical Research Council, Australian Research Council, and Cancer Institute NSW. In close collaborations with clinicians, his group of medical researchers are defining the molecular footsteps involved in diseases of the reproductive tract by using human tissue samples and novel preclinical disease models such as cancer patient-derived avatar models is. This comprehensive systemic approach has led to development of novel targeted therapies to improve clinical outcomes for human patients. My focus has been to answer fundamental questions on how the ovary and uterus function and to combine this knowledge with what goes wrong, leading to gynaecological diseases, including cancers in these organs. In the near future we will be accumulating compelling scientific rationale to modify, improve and replace current prevention and treatment strategies.